Rooftop Alternative School extends and enriches the learning opportunities in the classroom by connecting our students to the rich cultural life of the City. “Art Is @ The Center,” Rooftop’s art study theme for 2016-2017 reflects on Rooftop’s location at the geographic center of San Francisco. While the school began the year’s art study with a exploration of mindfulness through the form of the mandala, Kahn’s Negev Wheel invites viewers to take art and mindfulness for a spin through sculpture. To quote Janine Okmin, Associate Director of Education at Contemporary Jewish Museum, “In this gallery, art is literally at the center…” Using sand from the Negev Desert, “blown by the wind for centuries,” Negev Wheel invites a closer look at the invisible forces of rotation and gravity that are constantly at work in nature. A closer look at the movement of the sand mixture in the interactive sculpture that visitors set into motion. Kahn experimented with three variables to create Negev Wheel: tilt (of the wheel), speed (of the spinning), and viscosity (fluidity of the sand). This resource uses quotes, artist interviews, discussion questions, and suggested activities to examine Ned Kahn: Negev Wheel through five thematic lenses: natural forces; tinkering, engineering, and the artistic process; mindfulness; Jewish content; and art as metaphor. This guide is useful for classroom teachers or anyone interested in a deeper exploration of Ned Kahn: Negev Wheel. In Conversation With Ned Kahn from The Contemporary Jewish Museum on Vimeo. Watch video artist Benjy Young’s video poem about the entire process of making the artwork; from the inspiration and research of the artist to the finished design of the “Negev Wheel” installed at the Contemporary Jewish Museum in San Francisco. Todd Barricklow and his Ned Kahn Studios crew along with Justin Limoges and the Museum’s crew assemble the artwork so Ned can coax the exact perpetual avalanche of Negev sand for his show. Ned Kahn: Negev Wheel from Benjy Young on Vimeo. On Tuesday, May 12th, Rooftop students and their families have an exciting opportunity to visit the Autodesk Gallery, from 6pm-8:30pm. Autodesk, Inc., is a leader in 3D design, engineering and entertainment software. Customers across the manufacturing, architecture, building, construction, and media and entertainment industries—including the last 19 Academy Award winners for Best Visual Effects—use Autodesk software to design, visualize, and simulate their ideas before they’re ever built or created. 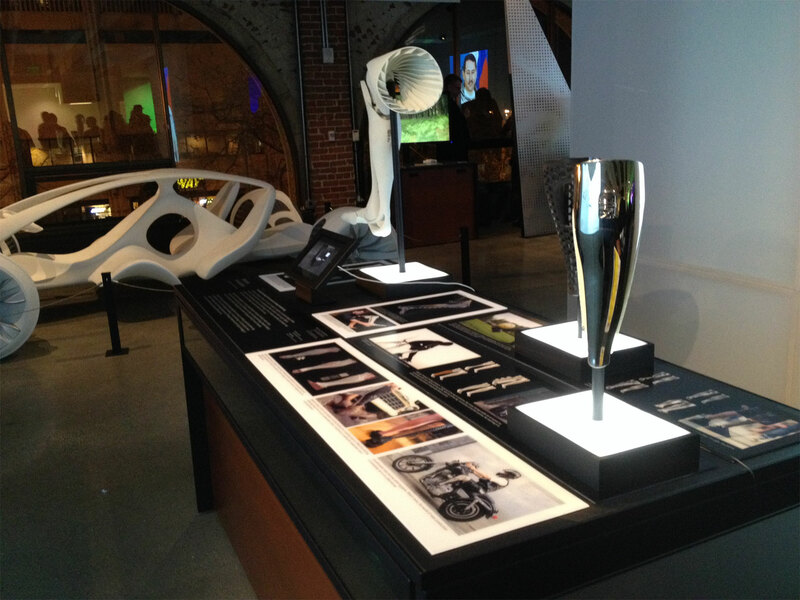 Bringing together stories of exceptional design and engineering from across the globe, the Autodesk Gallery celebrates the creative process and shows how people are using new technology to imagine, design, and create a better world. Named a top destination by Wired magazine and the San Francisco Chronicle, the gallery features more than 20 exhibits, including original works by Lego, Mercedes-Benz, Nike, and more. Rooftop students are invited to tour the Autodesk Gallery and to learn more about how STEAM learning is bringing nature and technology together with The Hummingbird Effect, thanks to a mini-grant from The Cornell Lab of Ornithology’s Celebrate Urban Birds. Try folding an origami bird or put your design & engineering skills to the test with the “Wish & Chips” STEAM Challenge. 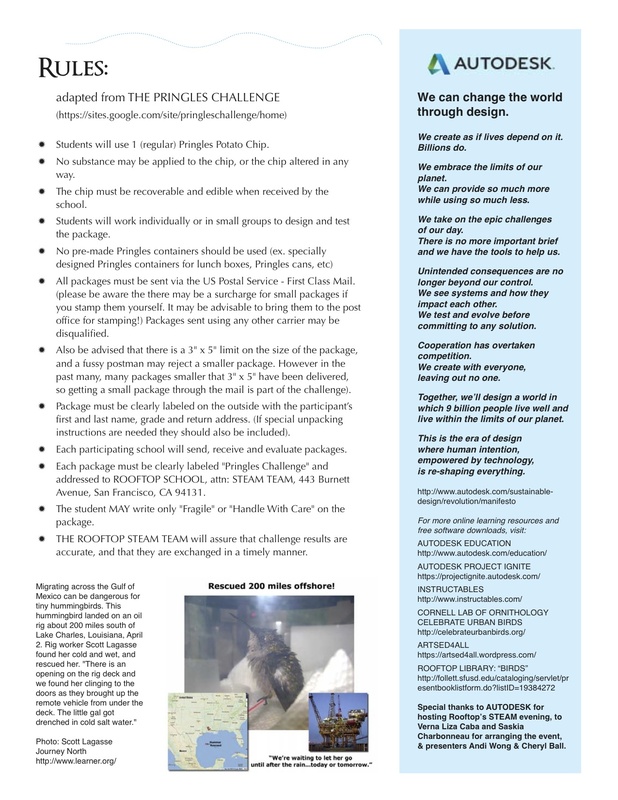 Students are invited to design and test a package to safely ship a single Pringles Potato Chip through the US Postal Service to Rooftop School. Packages must be postmarked and received by Friday, May 22, 2015 to be eligible. 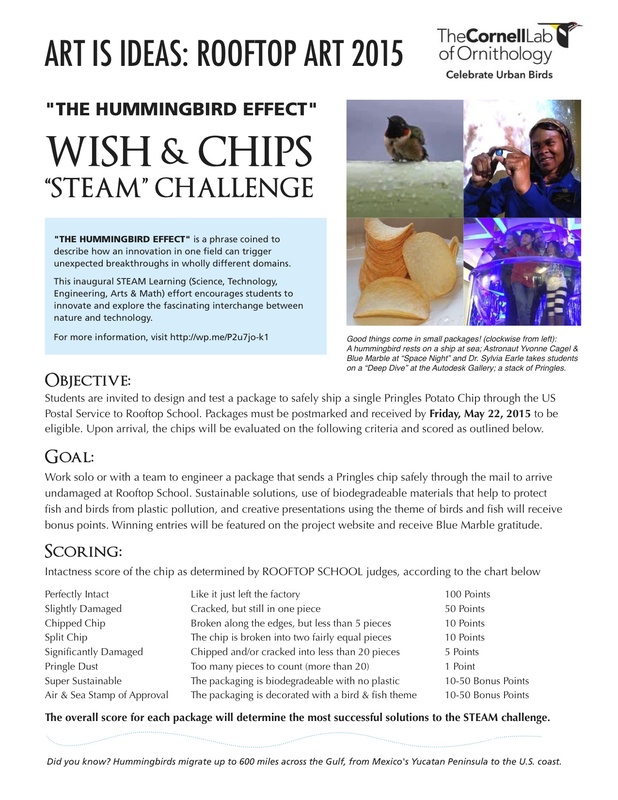 Download a pdf of the Wish & Chips STEAM Challenge. “A Moveable Feast” is a visual art lesson created for our 2011 Art Is… Expression study, in response to the art of Flo Oy Wong, visual storyteller. 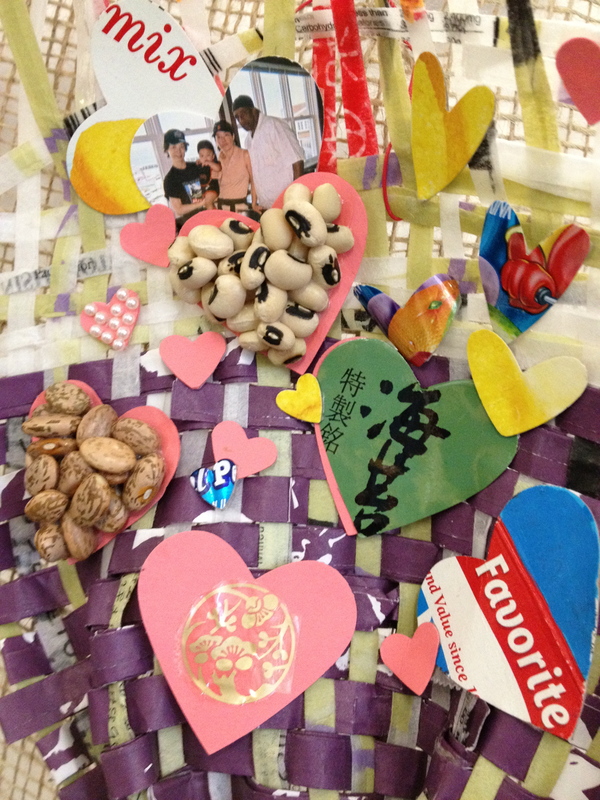 Rooftop families were invited to work together to eate a mixed-media collage using memories and stories about food as the source of inspiration. Artistic expression gives us a way to capture and share family stories. Food, like music and art, is often the way young children begin to learn about family and culture. We believe that art making gives us a way learn more about each other and helps to build connections between individuals, families, and inter-generational understanding. Art, like food, is a moveable feast that nourishes the spirit.